Convertible laptops are already becoming commonplace in the market, but Toshiba is taking the idea to the extreme with a concept PC that can physically change into five different modes. Called a "shape-shifting" PC, the product comes in three parts -- screen, keyboard and kickstand -- that can be arranged into different usage models. The motherboard is built into the kickstand. The PC can be turned into a typical clamshell laptop. But it also has two tablet modes, one that can be formed by removing the detachable keyboard, and the other by leaving it on and folding it back. Two other modes include a "Presentation/TV" mode that involves using the kickstand, and a "Canvas" mode that lets the user flip the attached keyboard 270 degrees, making the device better for drafting with a stylus. However, the product is still just a concept and Toshiba is hoping to gather input on the device while it's being shown at the International CES event in Las Vegas this week. It gave no pricing or specifications for the PC. Given that the device can shift between PC and tablet modes, Toshiba said it's considering installing both the Windows and Android operating systems. Users could then switch between the operating systems as they switch between modes. Other PC makers also are promoting convertible devices. 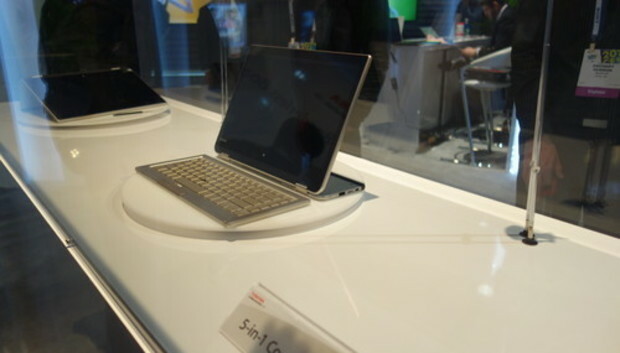 At CES, Chinese PC maker Lenovo is showing its Yoga 2 and Miix 2 laptop-tablet hybrids. Taiwanese rival Asus also unveiled a convertible that can switch between the Windows and Android OSes with the click of an on-screen button.